I’m a sucker for Chinese takeout. There aren’t many non-buffet Chinese restaurants around here, and I find that very disappointing! All of the Chinese food has turned into expensive all-you-can-eat buffets, but what about those times that you are craving a good eggroll? Or eggdrop soup? Or just some yummy chicken fried rice? You don’t want to have to go to an all-you-can-eat buffet just to curb those cravings. Chicken fried rice is so simple to make, and I can guarantee you that this homemade chicken fried rice is 99.99% more healthy then the stuff they will feed you at a restaurant. Actually, as long as you don’t go overboard with your oil, this is perfectly healthy! The fiancee looked at me last night and said “would this be too expensive to make everyday for lunch?” It is that good! An eggroll WOULD go perfect with this dish, but we don’t buy prepackaged eggrolls and I have yet to venture into making my own homemade eggrolls. 1. Cook your rice according to the package directions in a separate pan. 2. Heat a pan over medium heat and spray with no-stick cooking spray. While the stove is heating, mix together your 3 eggs and add to the pan once hot. Make an omelet out of the beaten eggs, but do not fold the omelet. (In other words, add the eggs to the pan, allow to cook on one side, flip and allow to cook on the other side) Place the egg on a plate to cool. Once cool, fold and coarsely chop. 3. Combine the cubed chicken, sesame seed oil, salt and pepper to a bowl, and mix until the chicken is covered. In the same pan that you used to cook the egg, add about tablespoon of EVOO and the chicken. Cook until no longer pink. 4. In the pan with the chicken, add your garlic, onion, and carrots. Saute for about 2-3 minutes more (until onion is translucent). Add in the frozen peas, and saute until they are no longer frozen. 5. Once your rice is done, add the chicken mixture, rice mixture, and chopped egg together. Add in soy sauce (I ended up using quite a bit more than 2 tablespoons, but I love soy sauce) and mix to combine completely. I’ve recently started to eliminate all unhealthy foods from my diet, and replacing them with healthier options. I’ve gotten rid of sodas (completely…no more “one a day” bull), Reese’s Blast (my Kryptonite), and chocolate chip poptarts. I’ve replaced these unhealthy foods with water and lemon, fruit&yogurt parfaits, and turkey bacon and eggs. Now I’m on a mission to find the healthiest breads. I’ve gathered a few tips to help you out and broke them down into two simple rules. – Simple enough right? I know it is hard to resist. White breads are much more delicious when dunking into a bowl of soup. 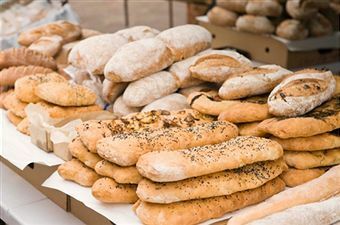 White breads should be given to children only because they have a hard time digesting the fibers in the healthier options. – These bread companies like to trick us. They will make a piece of “wheat” bread but technically is only white bread with a splash of wheat in it. Beware of these types of breads. Focus on those that mention wheat as the first ingredient. Only trust a whole wheat bread when it says “100% whole wheat” and on the back, the first ingredient listed is whole wheat. – Whole grain bread should contain the bran, germ, and endosperm. For it to be considered whole it must have all three of these. A true whole grain will be high in fiber so look for bread that has at least 3 grams of fiber per SLICE. The most simple way to ensure that you are getting a healthy bread is by looking at the ingredients and picking the one that has whole wheat as the first ingredient.